Heat oven to 350°F. Spray 13x9-inch (3-quart) baking dish with cooking spray. 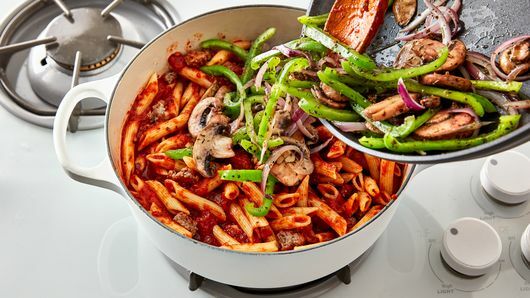 Cook pasta in 5-quart Dutch oven as directed on package; drain, and return to Dutch oven. 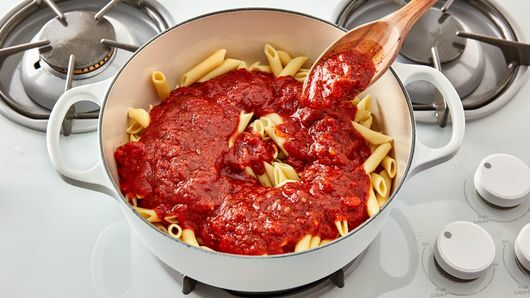 Add pasta sauce; toss to coat. 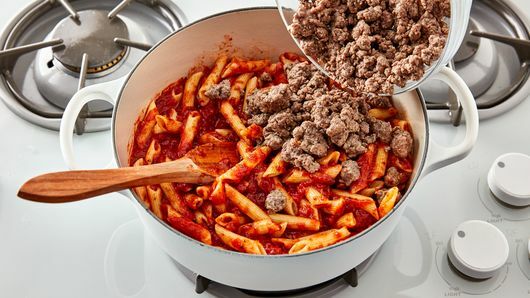 Meanwhile, in 12-inch nonstick skillet, cook beef 5 to 7 minutes over medium-high heat, stirring frequently, until thoroughly cooked; drain, and add to pasta mixture in Dutch oven. Clean out skillet. In same skillet, heat oil. Add mushrooms, onions, bell pepper, Italian seasoning and salt. Cook 7 to 9 minutes or until vegetables soften and begin to brown on edges. Stir into pasta mixture in Dutch oven. Stir in 1 cup of the cheese. Pour into baking dish. 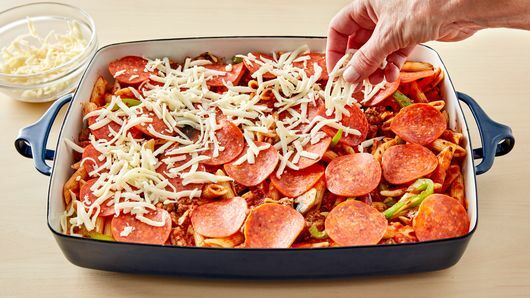 Top with pepperoni, then sprinkle with remaining 1 cup cheese. Spray piece of foil large enough to cover baking dish with cooking spray. Cover baking dish with foil, sprayed side down. 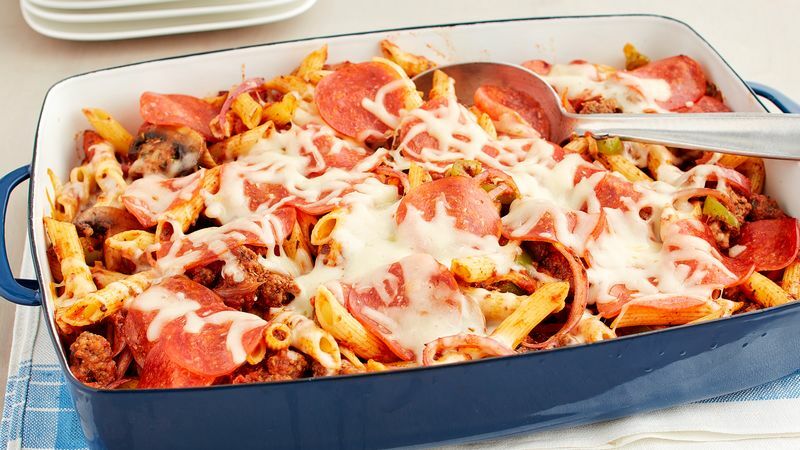 Bake 28 to 33 minutes or until heated through (at least 165°F) and cheese is melted. Remove foil, and let stand 5 minutes before serving. Save some time by purchasing presliced mushrooms. They are available in most grocery stores. To cut a bell pepper, cut 1/2 inch off top and bottom of pepper, then stand upright. Cut one side of pepper from top to bottom, then lay pepper on its side. Cut all the way around inside of pepper to remove seeds and membranes. Then cut or slice pepper as desired.